LinkedIn has been used by job seekers for years now in the hopes of landing their dream job. Companies are also turning to this social media site to look for potential employees whose background and skills fit well with their expansion plans. As a job seeker, just imagine a number of opportunities waiting for you when you decide to create a profile on LinkedIn. It’s good that LinkedIn has already set up a template for an online resume but the problem is that many are not really sure on how to build a professional profile. How then can you improve LinkedIn profile? So how can you go on about improving your profile on LinkedIn? For starters, check out your profile picture. Did you post a photo of yourself or did you choose a picture of you together with your dog, your girlfriend, or even a relative? If you want to improve your profile, the first thing that you need to do is to choose a professionally taken photo and use it as your profile. You should also practice utilizing the headlines of your LinkedIn profile so your readers will get an idea of the services that you are offering. We take pride in the fact that all clients who asked for help with their profile are happy with the results because they know that they are working with expert profile writers right from the start. You too can make use of our service as long as you complete the order form and have paid the fee. For sure, you will be receiving numerous views from possible connections and employers if you have done a good job on your LinkedIn profile. Writing your profile: Your LinkedIn profile needs to be written in a style that is professional, positive and reflects your passion for your profession. If there is a certain type of language used within your industry include this in your profile. Also keep in mind if your profession is formal or informal, again this needs to be reflected in the way you write your profile. If you’re hoping to join a creative industry you need to spend even longer ensuring that your LinkedIn profile is original, innovative and reflects your creativity. Essential information: Your LinkedIn profile should contain all the essential information about your education, qualifications, skill, and experiences. It essentially should enable you to create a resume from LinkedIn profile. This means that it should highlight any aspect of your career that you are particularly proud of or parts of your education that are relevant. Image: Image is important, and while you don’t have to look perfect you do need to come across as professional, positive and friendly in your LinkedIn profile image. It might sound obvious but the image you choose shouldn’t be one taken on vacation or out partying. Instead, it needs to be professional, perhaps wearing a suit or at least in professional clothes. And remember to smile; no one wants to hire someone who looks miserable! Skills and endorsements: Listing your skills and getting people to endorse you is a good way of making it easy for prospective employers to quickly see if you have the experience and skills they are looking for. Even if you haven’t yet landed your first job, you will have gained skills during your education so list these. As your career develops your skill set with grow. Endorsements shows that other people agree you have the skills you say you have, they are sort of an informal reference. Keep refreshing: Once you’ve created a LinkedIn profile the work doesn’t end. You need to continue with your LinkedIn profile development as your career progresses. This means adding new skills as you gain them, connecting with people you meet within your industry, updating your qualifications and experience as you gain them. Update your image every year, as people don’t want to see an image of you and then meet an entirely different looking person. Also re-write your profile every so often, so that it reflects where you currently are in your career and not where you were three years ago. Let us be part of the creation of your LinkedIn profile, and get ready to start receiving the best searching results you ever imagined. As with any existing resume, you always need to update it every time you acquire a new skill, move to another job, and so on. The same thing should be applied to your LinkedIn profile to ensure that all the information you’ve included in your online resume is accurate. So how can you optimize LinkedIn profile? Check your headline. 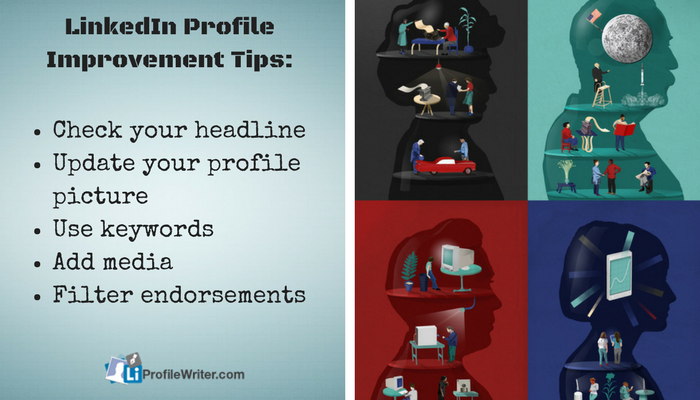 Most profiles in LinkedIn don’t have an outstanding headline that will make them stand out. It is always a good idea to build an eye-catching headline that will pique the interest of your readers for them to linger longer in your profile. Update your profile picture. Again, there are dozens of profiles out there that lack a professional photo to go along with their online resume. This is one of the reasons why you don’t generate enough interest from possible employers. It is the time that you get a professional photo of you taken and use it to put a face to your name in your LinkedIn profile. Use keywords. Since this is an online resume which is posted on the internet, you need to make sure that your profile is searchable. Use relevant keywords in your headlines and content of your LinkedIn profile to increase your chances of being found by the right people. Add media. If you have links, photos, PDFs, audio recordings, and videos that are related to your work, you can also add them to your LinkedIn profile. These will help others see how you work. Filter endorsements. As much as you would like to add all the endorsements given to you to your profile, sometimes you need to remove those that aren’t related to your skills or niche. This will certainly help your profile in the long run. Upgrade your career and get the job of your dreams! Let us help you write an effective and attractive LinkedIn profile page now! If you look at existing profiles on LinkedIn, you will find that there are some profiles that look better than others. Our experts have looked at various profiles on LinkedIn and have found numerous errors that are best avoided. For starters, when choosing a profile photo, make sure that you are the only one who is in it. Keep your photo as professional as possible. After all, this is an online resume so you need to get a good shot of your face. Another mistake that you shouldn’t repeat is using the generic connection request. It is better that you personalize your message so that there is a better chance of your request being approved. If you are updating your profile because you want to look for another job while still employed, don’t forget to check the privacy settings. Many have made the mistake of not checking their privacy which allowed their bosses to see their activities. “Can you improve my LinkedIn profile?” Yes, we can because we’re professional LinkedIn profile editing and writing service and because we have the best writing team on hand. Our writers will help customize your LinkedIn profile so that it will highlight your strengths, show your background, as well as your area of expertise. We will also use different features of LinkedIn such as blogging platform, add multimedia and the like so that your visitors can know a lot about you easily. We know that there are a lot of LinkedIn users who are not familiar with the use of LinkedIn which is why we are more than happy to provide you with the assistance that you need. All that you have to do is fill out the form on our site, provide us with information about you, pay the fee, and wait for your writer to get in touch with you. We guarantee that you’ll be working with one of our experts so that you’ll get the best profile with us. Who Can Improve My LinkedIn Profile? The way you build your LinkedIn profile plays a role on how visible you can be when employers search for new people to join their team. When revising your profile, you need to take stock of the errors that you have committed to building your first profile so you can get an idea of what areas need to be worked on. For example, there is the headline which is hardly ever used by LinkedIn users. There is also the blogging platform which isn’t really utilized at all because it has been frequently used as a platform to promote a company. Fortunately, our writing service knows how best to customize your profile in a way that it will stand out in the crowd. From writing compelling headlines to rearranging the structure of your online resume, you can expect us to produce quality output no matter how fast you need it. With our help, there is a bigger chance that you’ll get noticed among LinkedIn users in no time. For those who are looking for LinkedIn profile writing services for their profile, you should come to us. We can help improve LinkedIn profile easily thanks to our professional writing team on hand. We guarantee that we’ll be able to customize your profile in such a way where you will increase your chances of getting noticed by the right kinds of people. All that you have to do is place an order with us, pay our fee, and we’ll start revising your profile to make it better. “I need someone to improve my LinkedIn profile.” Does this sound like you? This isn’t surprising given that many LinkedIn users are not really aware of the possibilities that they are missing out because of their poorly done profile in this online platform. LinkedIn has gained traction over the years as the best place to create LinkedIn profile, an online resume that is accessible to everyone. Employers and employees alike are using this social media site as a place to work with one another. However, there are those whose profiles aren’t really eye-catching like the others which is one of the reasons why hiring a professional profile writer is worth considering. The good news is that there is no shortage of choices online but if you are looking for quality results, we are the best service to hire. If you’re wondering how to improve LinkedIn profile in 7 days for better networking create the most bright profile. Hire our expert writers to improve LinkedIn profile and we guarantee that you will stand out in no time!